From the variable frequency drive basics, we know it may be able to offer significant energy saving opportunities for specific applications. However, when considering purchasing and installing a variable frequency drive care must be taken to ensure that it is the correct selection and that it is properly applied in order to achieve optimum energy savings. This paper provides the basic guidelines on issues to take into account when selecting an AC variable frequency drive (VFD). What type of torque load will be controlled? The largest energy savings can be achieved from variable torque loads such as fans and pumps whose outputs have been regulated in some way. Refer to this paper regarding the types of load. In applications where a reduced output is required but which remains constant it may be more appropriate to install smaller fixed speed equipment. Your equipment supplier will be able to advise on the best method of estimating and selecting the biggest potential energy saving ways, some offer a monitoring service, where they will monitor equipment for a period of time before choosing a particular solution. Disused dampers, throttles and valves. Faulty control components such as valves or dampers. It may be possible to reduce the size of the motor and other equipment being controlled, and lead to the select of a smaller variable frequency drive. What size of variable frequency drive is required? 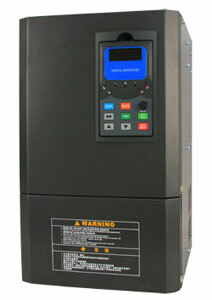 The variable frequency ac drive is usually sized according to the size of the ac motor. In some circumstances such as at high altitude, warmer environments or where the supply voltage is low the variable frequency drive might need to be de-rated. Consult your variable frequency drive supplier for guidance on choosing the variable frequency drive size. What type of control is required? It is possible to control variable frequency drives manually however this approach is prone to human error and response times can be far too long. In the majority of applications, variable frequency drives are used as part of an automatic control loop; in a control loop, a transducer monitors the flow-rate or pressure and then a process controller (or the variable frequency drive) generates the correct speed-demand signal automatically. For example a pressure transducer will provide feedback that the controller will use to signal a speed change in the pump to maintain a constant pressure in a building where the water demand is variable. Another is the use of an oxygen sensor informing a control loop to regulate the speed of a fan to trim the oxygen levels in a boiler. Control loops have the advantage of performing rapid corrections, minimizing wastage and maximizing the energy savings. The decision on the type of control required should be followed the selection guideline of your equipment supplier. AC variable frequency drives can introduce electrical harmonics (a form of electrical pollution) on to the electrical supply which can be harmful to other equipment. There are regulations governing the permissible levels; to meet these requirements optional electrical filters may be fitted to the supply, or a different rectifier stage in the variable frequency drive may be selected. Where variable frequency drives are located some distance from the ac motor certain cabling restraints might apply; in all of these your variable frequency drive manufacturer will be able to provide suitable guide. Older motors: some older motor designs may not have sufficient electrical insulation in their windings to withstand high transient voltages that can occur with the use of variable frequency drives. They should be checked to ensure their suitability for variable frequency drive controls. Bearing currents: in some applications mainly with large motors (90kW and higher) or where high switching frequencies are used there is a risk of stray electrical currents being induced in the ac motor which can cause damage to bearings. Insulation breakdown: very long cables runs, or high frequency switching can cause high transient voltages that may be damaging to winding insulation. Motor cooling: ac motors operating under variable frequency drive control tend to run a little hotter than ac motors directly connected to the mains supply. When ac motors are operated at low speed their cooling fans loose effectiveness and alternative methods of cooling are required. Ensure adequate cooling is achieved; the threshold for additional cooling is specific to the installation. In some applications ac motors may be derated to ensure adequate cooling.